Jenny demonstrates how to join columns of flying geese, a technique used both in the original vertical variation of Zippity Doo Dah, and in Jenny’s new horizontal variation. She then shows laying out the blocks in a horizontal variation. The sashing color she had originally chosen didn’t work so well once all the blocks were sewn and laid out. 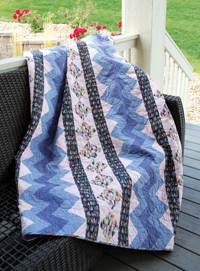 Jenny shows several ways to deal with colors that don’t work – from simple replacing a section with another color to completely rearranging the quilt’s design to work with the pre-selected color choices. I thought these videos were step by step? from the beginning the units are sewn together….. This video shows how to sew columns of flying geese together. If you’d like I can send over a few resources we have on sewing the units. Let me know!